Life in the emergency room is often like that in the business world. Both are places of activity and excitement, unexpected developments, highs and lows, crises, and great intensity. On the treatment table and in the boardroom, problems must be diagnosed correctly and dealt with as effectively and quickly as possible. Now in "Management Lessons from the E.R. 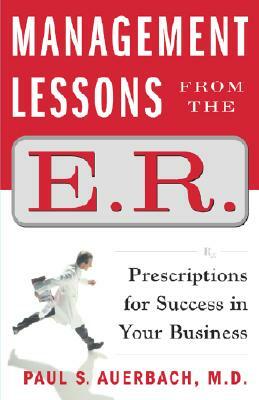 : Prescriptions for Success in Your Business," Paul S. Auerbach, M.D. -- a doctor of medicine and of companies -- shows exactly how a professional healer's thought processes can be applied to a business. The result is enlightening, occasionally lighthearted advice that goes far beyond other business management tomes, offering readers real and surprising lessons. Applying such medical truisms as "The patient who isn't screaming may be the one in the most trouble" and "Don't count on luck," Dr. Auerbach provides prescriptions for solving all types of managerial emergencies. Using real-life experiences from his many years as an E.R. physician, COO of public and private medical management companies, and venture capitalist, he teaches executives how to prepare for and remain calm in difficult situations. In this unique book, he shows how responsibility, great expectations, and the impact of failure force doctors to be at the top of their game at all times. From assessing the first symptoms of a patient's or company's problem to determining the quickest and most effective means for treatment, Auerbach details the true-to-life pressures, fears, and challenges one faces both in acute care medicine and in the most vital actions of one's career, and does so with humor, style, and grace. The effect of this wisdom: the ability to dealwith any business dilemma, whether it be a short-term setback or the beginning of a more serious condition. The prescriptions here are lessons for success in business and, at the same time, for success in life. Author Name: Auerbach, Paul S., M.D. Description: 251 pp. Unread, new. No markings. An informal guide to business management based on experiences in hospital settings. Author is a surgery professor at Stanford and an HMO executive. Keywords: MANAGEMENT. MEDICAL. HOSPITAL. CORPORATION. BUSINESS. STRATEGY. CRISIS. DIAGNOSIS. ANALYSIS.